All items purchased are sold subject to use in compliance with the manufacturers instructions which are clearly marked on the items. All products comply with UK reguations and are suitable for use by non-professionals. 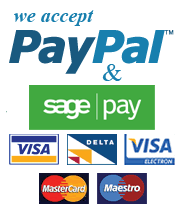 Our online credit/debit card facility is provided by Protx and Paypal - leading, state of the art secure online payment providers. If, however, you prefer to order by telephone, we will be pleased to take your order. Please email info[@]pestrepellersonline.co.uk with your telephone number and we will phone you to take your order. Delivery charge is £5.95 to mainland UK excluding the Highlands of Scotland. Orders outside our normal delivery charge area such as Northern Ireland, Scottish Highlands, and offshore islands will depend on weight and destination. Please email info[@]pestrepellersonline.co.uk for a delivery cost in these areas.